Capt. J. Kenneth Fanning, son of Mrs. James C.Y. Rhodes, graduated from Frederick High School. Entered the Army in Jan., 1942, trained in Ft. Knox, Ky. 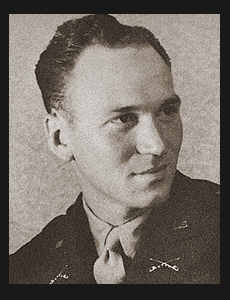 He served in England, Holland, Belgium, Germany, Luxembourg and France, where he was wounded in action in Aug., 1944. Awarded Victory Ribbon, Am. Theater Ribbon, ETO Ribbon with five Battle Stars, the Purple Heart, Bronze Star.